Amid today’s stumbling economic recovery, policymakers are examining a variety of measures to help businesses compete and grow their workforces. As part of this effort, it is critical that they understand how regional economies across our country stitch themselves together from the bottom up—what makes them tick and what they need to grow and thrive in the 21st century. Alas, federal innovation policies aimed at boosting the competitiveness of our economy through investments in science and technology commercialization are often grounded in 20th-century economic development strategies that overlook the importance of regional economies and no longer match the needs of the 21st-century global economy. Academics and policymakers alike understand the limitations of our current policies at the macroeconomic level. Federal funding for these commercialization programs, at less than 10 percent of the $150 billion a year we invest in basic scientific research, is “small beer”—a trivial amount given the challenges our nation faces from our global competitors. And federal programs designed to implement these policies are divided into a chaotic array of “silos”—policy speak for mutually unconnected programs— that make it exceedingly hard for the federal government to act upon any strategy designed to overcome our nation’s economic policy limitations. At the regional level, however, many businesses and universities, state economic development agencies and community colleges, venture capitalists and commercial bankers all depend on current federal innovation policy funds to pay for or complement their own efforts to boost commercialization of game-changing discoveries, incremental manufacturing, and service innovation alike. Despite the clear limitations of existing federal innovation programs, they remain important to our national economic competitiveness. So understanding the efficacy of these federal innovation programs is the first step toward understanding how to improve them or replace them. That is what we set out to do in this paper in one regional economy of our country—the eastern Midwest region that includes Pittsburgh in western Pennsylvania; and Cleveland, Akron, and Youngstown in northeast Ohio. The region, anchored by its major cities Pittsburgh and Cleveland, faces distinct challenges and opportunities. Regional economic growth, of course, is everywhere local and interconnected, but how much so depends on the vibrancy of each region’s innovative ecosystem. Silicon Valley in California, or the Route 128 corridor around Boston are famous “regional innovation clusters” in which businesses large and small, universities, federal labs, and financiers interact every day in a heady mix of creativity that powers our nation’s innovation economy. Places that have tried to copy their unique recipes, however, have not been very successful. And those places that succeeded at creating a high technology regional economy, such as North Carolina’s Research Triangle Park and San Diego’s Connect project, found that they needed to pave their own path. In similar vein, Hollywood has a different mix of players who achieve the same thing in southern California for our entertainment industries. And Nashville serves the same purpose for country music. The upshot: Every successful regional innovation cluster defines itself idiosyncratically and specifically to its own context, depending on its own defining economic activity—be it entertainment, biotechnology, information technology, or advanced manufacturing. But older industrial areas such as Pittsburgh, Cleveland, Akron, and Youngstown are places with substantial infrastructure and a proud industrial heritage that are struggling to redefine themselves in the global economy. The large corporations headquartered there that served as the backbone of the region’s 20th-century industrial economy are neither as numerous as they were 50 years ago nor as central to the region’s core economic competitiveness. In many different ways these companies have squandered their competitive advantages or watched as the forces of globalization overwhelmed those advantages. This leaves entrepreneurship (defined as new firm formation and scale-up) and innovation (defined as the creation of value in an economy no matter the size of the company or the source of the idea) as the most viable strategies for the economic future of the region. Our study sought out these new players in this region’s innovation ecosystem to ask them not only about the efficacy of federal innovation programs but also about how they interact with each other—how much they felt they worked and lived in an emerging regional innovation cluster. Along the way, we also asked these players about the region in search of the strengths and weaknesses of this once-thriving, metal-bending region of our country in the 21st century. Our survey of these firms and players on these subjects is the first one ever conducted. And our one-on-one interviews with dozens of key players in this new ecosystem only buttressed what we learned from our survey. We found in the eastern Midwest of our country an ecosystem of innovation and entrepreneurship that is emerging and vibrant, but also fragile, requiring the sustained efforts of local, state, and federal agencies working together to help firms survive and thrive. Problem is, we also found that local innovation programs that connect well with entrepreneurs are limited in scale, and the handoff with federal programs can be problematic at best because these programs are also limited as well as disconnected from each other. Local innovation programs that connect well with entrepreneurs are limited in scale, and the handoff with federal programs can be problematic at best because these programs are also limited as well as disconnected from each other. Within this one region, we find examples of companies that have worked well with the limited resources available to them. But many others still have a ways to go. We also find universities and state economic development agencies that thoroughly understand the role they need to play in developing a thriving regional innovation cluster. But we also learn about the limitations these institutions face. Financing is lacking both for young innovative companies and for established medium-sized companies as they try to carry promising new or incremental technologies to market. Accessing federal innovation funds is exceedingly time consuming, often self-defeating, and in the end usually too small to be of enduring use. State and local innovation funds are pursued to a greater degree than federal programs but are too small for the needs of the region’s firms. Federal, state, and local funding programs nonetheless can be useful in attracting private financing even though these programs are not well-coordinated. These findings are troubling for a variety of reasons. Many entrepreneurial business ventures depend on these government programs as they discover, develop, and begin to move innovation toward the market. Without critical public support, these entrepreneurs may not be able to survive. For a long time, economic development policymakers have recognized that the infamous “valleys of death,” where good ideas lack the financing to become companies that hire well-paid workers, seriously threaten the creation of new firms and the expansion of existing firms. This debilitating financing gap is compounded by current economic conditions and a banking crisis. The result: The entire spectrum of small- and medium-sized firms and even larger firms in the region face a crisis in securing expansion and working capital. Finding management, engineering talent, and well-trained workers in the region is not a significant challenge for companies. Startup companies and established small- and medium-sized firms are building on the region’s historical strength in industrial activity to create new products and services in emerging industry clusters within the region. These companies recognize they operate in clusters and would welcome a regional innovation cluster coordinator who could bring together private sector companies; nonprofit organizations such as universities; and federal, state, and local government officials to better align economic policy with the needs of companies in the region. These core findings underscore the need for the federal government to overhaul its innovation policies and to work more closely with state and local leaders in the public and private sectors to sort out what works and what does not. Our study also points to the need to completely rethink how we go about encouraging regional economic development in the 21st century. Bottom-up, locally organized innovation programs that stitch together federal, state, and local economic development programs would serve our national economy best in the 21st century. This should be financed through public-private partnerships that include all the players in a given regional innovation cluster. The federal government has a major facilitating role to play in this process— one that includes significant increases in financing without monopolizing decision making. Each locally organized cluster will be different and thus will need region-specific support from federal, state, and local governments. We believe our survey and our analysis demonstrates the need for the Obama administration and especially Congress to embrace these principles as they go about reforming our economic development programs to meet the needs of the 21st-century innovation economy. 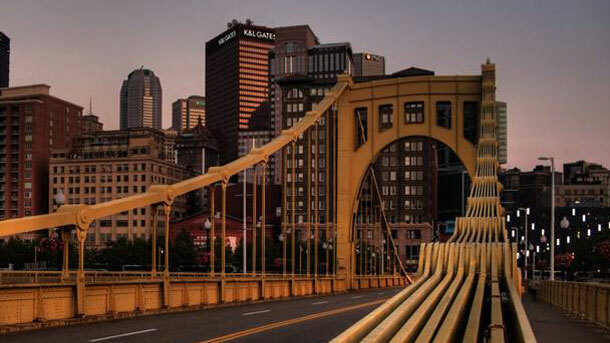 Pittsburgh, Cleveland, Akron, Youngstown, and their surrounding communities are changing rapidly because of globalization and in reaction to globalization. Our policymakers in Washington, in statehouses, and in municipal town halls need to give them the tools they need to succeed. Maryann P. Feldman is the S.K. Heninger Distinguished Chair in Public Policy at the University of North Carolina, Chapel Hill, and Lauren Lanahan is a graduate student in the Department of Public Policy at the University of North Carolina, Chapel Hill.